From Kandy we headed further into the central Highlands to Nuwara Eliya, the main town in the tea growing region and historically the place the English escaped to during the hottest months attracted by the cooler climate, golf course, Hill Club (think Indian Summers) and an endless social whirl. We left Ellerton and drove to the nearby town of Gampola where we were due to catch a train to Nanu Oya, the station nearest to Nuwara Eliya, recognised as one of the classic railway journeys. The station was very clearly modelled on Victorian stations in England but it has seen better days; this can be explained, and excused by its history of flooding. Flood markers on the platform showed water levels rising to ten or twelve feet in the first half of the C20th, and in 1947 the station was completely submerged. The last flood was in 1974, after that a dam was built on the river to create a reservoir and control the water levels. The train was announced as running 45 minutes late and to pass the time we accepted an invitation from the station master to visit the signal box; it is the original signal box still in use today and the staff were very proud to show us that it was British Engineered. It was amazing to see it still in use and Mark even got to operate one of the signal levers – confident in the knowledge that the train was still 30 minutes away! The train journey was terrific, it wound up the mountains climbing steadily and weaving around valleys and outcrops. We passed forest and waterfalls, villages and small holdings. As we got higher we started to see tea plantations and lots of market gardens growing leeks, tomatoes, cabbages and beans. It took about 3 hours to reach Nanu Oya where Odi was waiting for us having driven up with our luggage. There were hundreds of people on the platform waiting to catch the train for the next leg of the journey, the carpark was grid locked with cars, minibuses and tuk-tuk’s so we took the chance to grab a bite to eat (roti naan with chicken for me and cheese and tomato for Mark) at a café across the road from the station, it was very basic and we might not have chanced it if Odi hadn’t reassured us, even so we were quite glad that we were still taking the anti-malarial/antibiotics recommended by the travel clinic nurse in Cambridge. We left the station and drove to the Pedro tea plantation where we enjoyed an informative tour of the factory, this time with a guide who talked us through the process. Having drunk tea nearly all my life I now know the difference between Orange Pekoe (OP), Broken Orange Pekoe (BOP), Broken Orange Pekoe Fannings (BOPF) and Tea Dust. 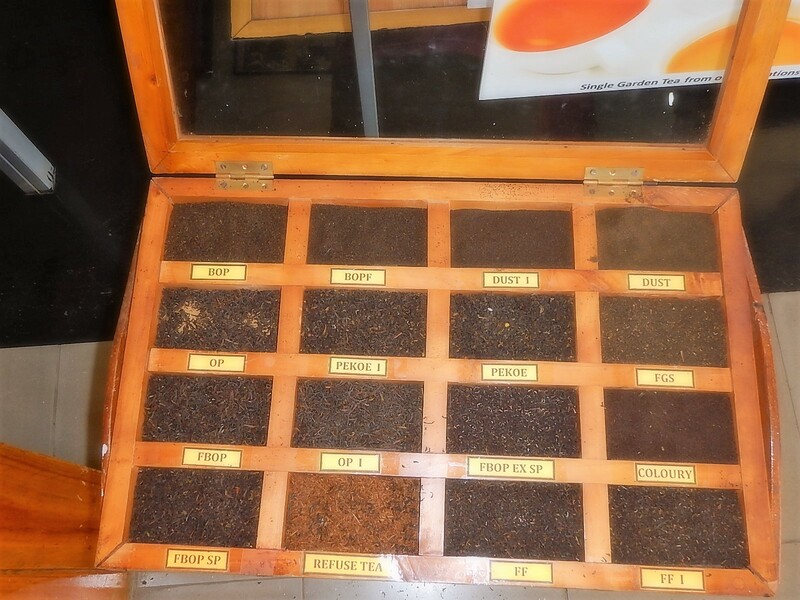 They are terms to describe the grade of tea, OP is the largest tea leaves which make the mildest tea, the smaller the leaves are cut the stronger the tea will be. As in Malaysia I particularly enjoyed drinking a cup of BOP while looking out over the tea fields. From there we set off for our next hotel, Warwick Gardens, another plantation bungalow right up in the hills overlooking a tea plantation. Our travel itinerary warned us that the road up would be bumpy with sheer drops in some places, “as you would expect from a tea growing valley” we prepared ourselves for another white-knuckle ride. Once again Odi did a great job getting us to the hotel in one piece, it was very bumpy and very narrow and I tried not to wonder what would happen if we met someone coming the other way. There was a very sharp hairpin bend at one point with no barrier, Odi negotiated it in a single manoeuvre but some other guest we met latter arrived by minibus and had a hair-raising experience when their driver picked the wrong gear while executing a three-point turn. When we arrived at Warwick Gardens the hotel more than made up for the journey, it was a very solid, elegant country house with an amazing view down the valley and terraced lawns surrounded by herbaceous borders. Dinner orders were taken on arrival, initially by country (Sri Lankan, Indian, western) and then from one or two options. We had tea on the terrace and met our fellow guests, Rajan, a Sri Lankan who left the country 40 years ago, and now lives in Pennsylvania, his son David from Denver and his brother in law John and his wife Ann from Cornwall (small world!). Rajan was relishing his first return visit and had lots of stories about growing up in Sri Lanka; he had also lived and worked all over the world and was a charming and entertaining companion, we got on well with the rest of his family too and exchanged contact details with Ann and John agreeing to meet up when we get to Cornwall. After taking time to rest and freshen up we all convened in the drawing room for gin and tonics before dinner. Dinner was served in the dining room where we were all seated at a grand dining table under a crystal chandelier; the food was excellent and a good time was had by all. Did anyone mention Downton Abbey? The next day we were due to visit Nuwara Eliya but the area around the hotel was so beautiful we were tempted to stay there and enjoy the surrounds. Odi was very happy not to drive up and down the valley again and said we would have time to visit the town when we left to drive south. We had an excellent breakfast, when everything was either homemade or from the garden, including the tea and coffee. After that we donned our walking boots and the three of us set of on a two hour walk through the tea fields dipping down the valley, through the tea pickers village and back up to Warwick Gardens. We spent the afternoon reading in the shade and enjoying the views, Rajan and his family returned from their excursion in time for afternoon tea and we sat outside talking until we realised the sun was setting and we were all getting cold, a very unfamiliar sensation! Everyone headed in for hot baths and showers, at dinner Ann and I were wearing cardigans and the men were all in long sleeves, just like home. We left Warwick Gardens the next day and drove to Nuwara Eliya where we planned to spend an hour or so looking round before driving down from the highlands to Udawalawe National Park where we were booked for an afternoon safari in the National Park. We rattled down the long road from the hotel dodging pot holes and lumps and trying not to look over the edge, eventually we reached the ‘main’ road and finally the centre of Nuwara Eliya. Odi was just backing into a parking space when we heard aloud crack from the front of the car and the steering went. We got out to have a look, quickly joined by a tuk-tuk driver and the driver of the car in the next space and we all agreed the front wheel shouldn’t be at that angle! Within ten minutes the tuk-tuk driver had taken Odi to find a mechanic who came to have a look, we went for a walk through the local market while the mechanic repaired the car enough for it to be driven to his workshop. Apparently the tracking rod that controls the steering had come loose, and the mechanic told us that if left the front wheels could have fallen off at any time – we tried not to think about the road down from the tea fields. Not wanting to put too much weight in the car the other driver offered us a lift to the workshop and even offered to show us around the town. However, we didn’t know how long the repairs were going to take and the workshop was opposite the entrance to Victoria Park so Mark and I spent the morning exploring the park checking back now and then to see how things were going. By one o’clock the car was fixed and we were on our way; Odi had phoned ahead and rescheduled our game drive for the following morning so we didn’t even miss out on that.